The Vought F4U Corsair is a single-engine single-seat fighter aircraft produced by the US-American manufacturer Vought Sikorsky Aircraft, later by the Vought Division of United Aircraft Corp.. The Corsair was developed as a carrier-based fighter but was also operated land-based. 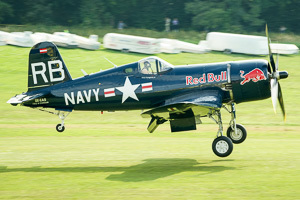 The F4U Corsair was also produced by Goodyear as the FG Corsair and Brewster as the F3U Corsair.